Calgary’s LGBTQ2S+ history is long and storied but largely invisible within the city’s public realm. We’re changing this by creating a LGBTQ2S+ commemoration in Calgary. You've identified the pivotal places, memories, stories, and spaces of Calgary’s LGBTQ2S+ community. Now we're creating an LGBTQ2S+ commemoration in YYC that reflects YOUR experience. Click on the image above to open the complete PDF and hear what Calgary's LGBTQ2S+ community desires for queer spaces! 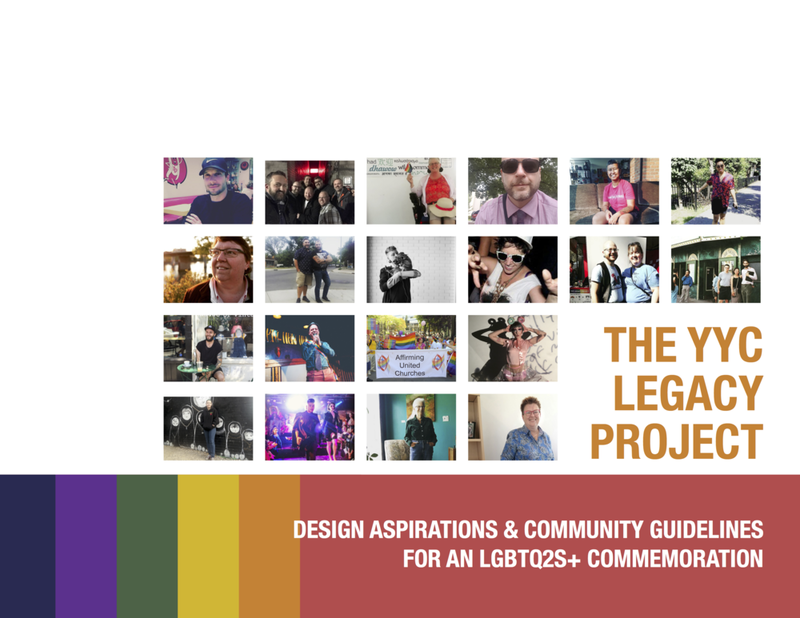 In February and March of 2018, the YYC Legacy Project held community design charrettes to hear Calgary’s LGBTQ2S+ community’s vision for an LGBTQ2S+ community hub, as well as an LGBTQ2S+ public plaza and monument. Participants shared ideas on their desired visual and spatial qualities as well as programming needs. We took the community's ideas and voices and combined them in a design aspirations guide to inform the future design of these spaces - or any LGBTQ2S+ space in YYC. Future design teams may facilitate the design and creation of these spaces, but the design guidelines are goals are set by the diverse voices of Calgary’s LGBTQ2S+ community. As determined by you! Click on the map below to download and print the PDF at home for an analog ramble around the Beltline. This story map explores the places and stories of Calgary's past and current LGBTQ2S+ community that emerged through PHASE I of the community engagement process. We'll add stories, spaces, and Photos to this story map as we receive them. SO contact us! It's never too late to make your voice heard. Calgary's LGBTQ2S+ Legacy Project Steering Committee is comprised of different stakeholder groups from across the LGBTQ2S+ community. Membership is diverse and representative of different ages, ethnicities, orientations, and genders. We are grateful for everyone's participation and the support of partner organizations. Calgary's LGBTQ2S+ Legacy Project would not be possible without the generous support of its funders. We make it easy to share your stories and have your voice heard. Whether it's on social mediA, an in-person interview, or via AN on-line form.